Attending Taylor Swift’s concert wasn’t exactly part of my plan. The truth is, the moment that her tickets went on sale, it was sold-out – even if her concert was three months away from the said date. So when I found out, probably a day before her actual concert, that there was a spare ticket waiting out there for me – thanks to my friend and co-concert hopper, I said, sure, why the hell not. So the following day, I boarded the train and headed to Araneta, only to find kids who are more or less half of my age lining up to see the adorable Ms. Swift. For a while, I did feel that we looked apart from the main audience, but what the hell — I knew that my friend and I knew the words in her songs anyway, so we can line up with the kids and their moms and/or dads. The big difference, however, between lining up with kids and adults lies in running. When you’re with adults, you can see who’s in front of you, and if you’re about to hit someone – when you’re lining up with kids, it’s pretty tricky, because they’re smaller, and I have no intentions of squishing them. It was pretty crazy outside and inside, there were screaming tweens, a lot of hands with number 13s – which is apparently, Taylor’s favorite number – there were posters, face painted with some glitter, and weirdly, a girl who’s wearing a blonde wig. 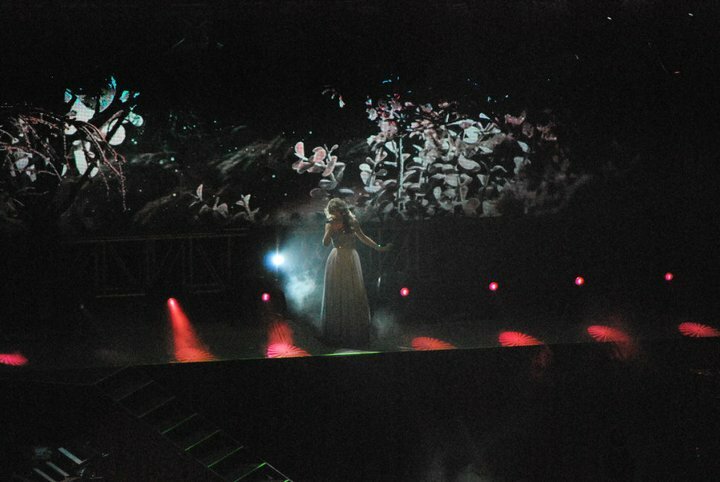 In short, it was really a concert for Swift’s fans. Before that concert, I was able to get a copy of Taylor’s album “Speak Now” maybe a month before for my friend, so she can sing. It’s not really fun to watch a concert and not know what the hell the band/artist is singing. So minutes before Taylor came out, I said to my friend, “Let’s guess her first song!” Turns out, she already had a copy of her set list and knew what her first song was, which is “Sparks Fly”. I guessed the same thing though, so Taylor came out and pretty much sent every kid in the house in frenzy. Sam Concepcion opened the show, btw, and let me just say, he was kinda good. I wasn’t expecting him to get the kids excited but he did – and as proof, I ended up recording his songs with my camera, therefore lessening my battery time for Taylor. That’s a mistake I learned in this concert, because I only ended up recording bits of her other songs while I’ve got a whole recording of Sam Concepcion. Ha! 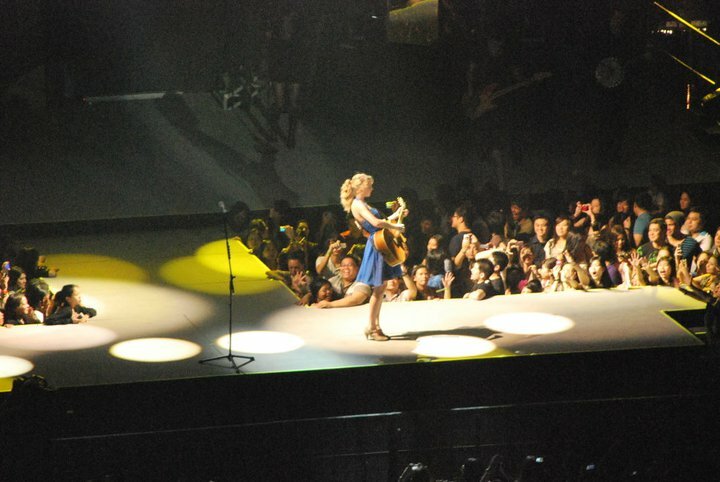 Taylor was kind of awesome as well; she talked to her audience and looked real pretty. She’s got 4 costume changes, and dabbled on her songs. 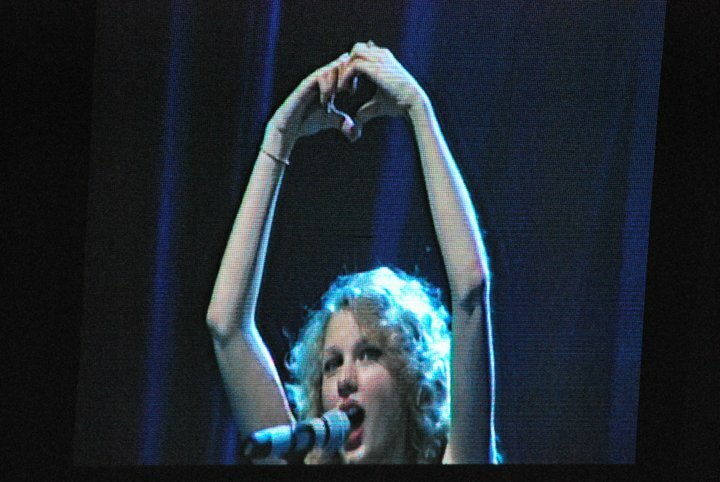 She sang most of her songs in the new album, but managed to squeeze in “Love Story”, “Fifteen”, “Fearless”, ‘You Belong With Me” and a bit of “You’re Not Sorry” in her “Back to December” performance. She squeezed in Once Republic’s “Apologize” in that song too — which is pretty cool. It was a pretty good night, over all. Taylor was a good performer, and she reeks of adorable-ness (such a word?) even if I was tons of feet away from her. I guess she just sparkles, even without those glittery clothes she likes so much.